Click an individual blue links below to read my tip-filled pages on each of these top 5 adventure cruises. 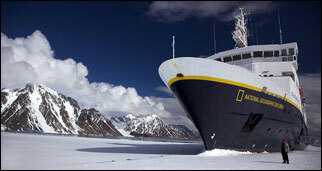 Most ships visit the Antarctica Peninsula and its offshore islands. They sail during the warm months of the Southern Hemisphere, November through March. The two best months are January and February. Passengers make shore excursions to the islands that helped inspire Charles Darwin's Theory of Evolution. zBEST PARTS: Svalbard Island (this far-northern Norwegian Island is known for its polar bear sightings and icy rugged coastline) Iceland (famous for glaciers, geysers, and volcanoes). Greenland (spectacular glacier coastline). Runners-up: Baffin Island (Canada) and North Cape (Norway). The Lower Mekong cruise is in Vietnam and Cambodia and is best because it includes a visit to Angkor Wat, one of my Top 100 Wonders of the World. The Upper Mekong route is in Laos and Cambodia, and passes through the Golden Triangle. BEST PART: The Upper Amazon (especially in the Iquitos area in Peru). The Lower Amazon in Brazil is less thrilling.